Unfortunately it’s that time of the year again. U-Pick Raspberries are done! It’s gotten too cold and we’ve had a couple small frosts here and there. Thanks for coming out to our fields to pick, and thank you to all of our amazing U-Pick Gurus for volunteering your time to help coordinate our operations! We could not have done it without you. If you’re already missing our organic raspberries, make sure to pop by the Farm Stand for some of our last jars of raspberry jam! Every season, we open up our fields for U-Pick Raspberries. Our fruit is an organic late bearing crop that starts to ripen in late August or early September. We have limited rows of raspberries that we like to keep as a nostalgic holdover from a time before Wright-Locke became the community-centric farm that it is now. Many who grew up in the area remember crisp Autumn days of delicious berry picking – we strive to continue this tradition, while at the same time making room for other important farm operations that support our annual vegetable production, volunteer efforts, education programs, biodiversity, and diversification of revenue sources. Berry picking is officially done for the season! Check back next year for information on the next U-Pick season! Thank you all who came, you’re the reason we can still keep up this beloved tradition. Raspberries are the only U-pick item. Other veggies & flowers are not for picking. Picking Raspberries at Wright-Locke is Simple! Grab 2 buckets, one for your “Take-Home-Berries”, one for your “Chicken Berries” – these are the ones that are overripe and squishy or might have mold on them. We appreciate you taking them out of the fields so we don’t have rotting berries in the fields attracting pests. Taking two buckets helps us keep the fields clean and healthy! Pick to your heart’s content. Then head back up to the patio station to pack up your berries. Pour your “chicken berries” into the labeled bucket. Pick out your containers (quarts, pints, half pints) and pour your berries into them. Cover your berry container with a protective “hat” so none of them go escaping! Head in to the Farm Stand with your berries to get them weighed and paid. Enjoy your berries now at one of our picnic tables, explore the farm and the trails, or take your bounty home to share and enjoy for the next couple of days. You can also freeze your berries so they’ll keep much longer! Please pay after you are all done picking! If you pick more than $10 in raspberries, the entry fee will be waived. Entrance fee will be added upon checkout. Reduced price from last year to accommodate entry fee. Every year we open up our fields for the community to pick delicious organic raspberries (there’s nothing tastier – such a summer treat!). Raspberry picking at Wright-Locke is also a long-standing tradition within our community that we like to honor. But, our beloved raspberry crop is only around for about two months of the year and is super sensitive to the weather conditions and pest pressure, so we all need to make sure to enjoy it while it is here! Join us at the farm patio during our “open picking hours” to help welcome and instruct pickers. Help with setup and breakdown of our raspberry packing station and facilitate the flow as people go in and out of the fields. This is a great way to learn about the farm and spend time in the gorgeous late-summer and fall weather while getting to meet other community members. Logistics: Complete a half hour training session, volunteer hours will consist of 2-3 hour sessions concentrated on Wednesdays, Thursdays, or Saturdays depending on weather (Morning and Afternoon sessions available). Volunteers should be 14+ (some exceptions for parents who volunteer with a child). 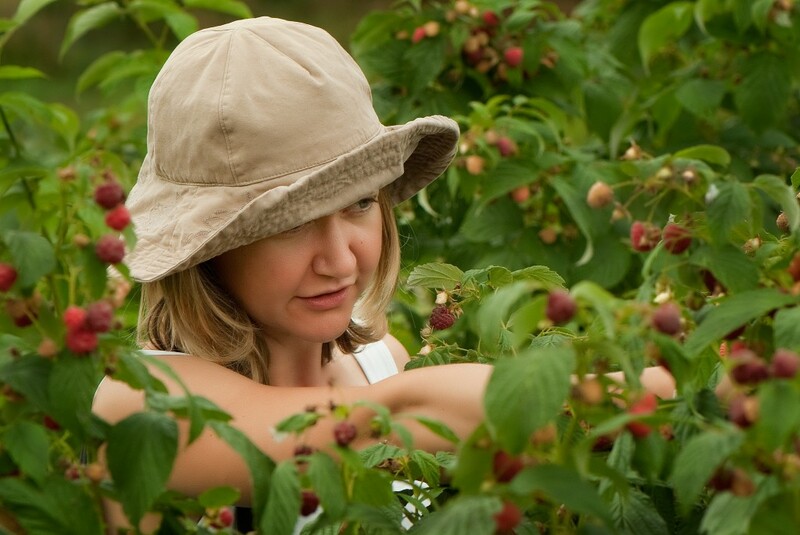 E-mail U-Pick coordinator, Kim Kneeland to become a U-Pick Guru. If individual, meditative raspberry picking is more your speed, come and volunteer in the raspberry fields! Because the raspberries can come in fast and furious and we don’t want to waste any of their tasty goodness, our Farmer is in need of a picking squad! If you find raspberry picking to be fun, want to help us pick for markets and for our famous raspberry jam (and maybe get some berries to take home as a thank you), then this is the opportunity for you. You’ll receive a short training session with our farmer, then will be placed on her E-mail list so she can reach out when the fields are full and in need of picking. Picking sessions will be concentrated Tuesdays-Saturdays during the mornings and early afternoons with some exceptions. Volunteers should be 12+ (Children may volunteer with parents). E-mail Farmer Adrienne to sign-up for our Picking Squad. This year, staff and volunteers are “adopting” a row of raspberries that they help clear out every week, to ensure the health of the fields. Those who adopt a row, will pick the “good berries” for the farm’s market and jamming production, and will deliver the “bad berries” to our chickens to get rid of the fruit fly larvae. Volunteers will get a short training session with our farmer and then will be able to schedule picking times with her going forward in the week. We’re making this a fun challenge – bring your friends if you are short on time one week, find someone to take your place if you’re on vacation another week, or just adopt a row with a good friend so you can tag-team throughout the season. Email our Farmer, Adrienne, if you are interested in adopting a raspberry row. What are the Rules for U-Pick? Please do not pick any other produce or flowers – Raspberries are the only U-Pick item. Do not throw raspberries – this can spread pests, disease, and is a sad waste of fruit! Yes, they are! All of our produce and flowers are certified organic. Which is very rare in this area as it is hard to deal with the many pests that LOVE to eat raspberries in an organic manner. The Spotted Wing Drosophila (Drosophila suzukii), is an Asian species of fruit fly recently introduced in the United States. It was first found on the west coast in 2008, but has rapidly colonized many fruit-producing regions of the country. Most fruit flies are annoying but harmless, propagating in overripe fruit. Instead, the SWD lays its eggs in fruit just nearing its peak. A few years ago, SWD arrived unexpectedly in New England, forcing Wright-Locke Farm and most other raspberry growers in the region to close down early. Learn More about this pest here. Can I Bring My Own Containers? Definitely! We have buckets for you to pick into, then when you return to the farm stand to weigh and pay for your fruit, we will tare your containers and pour the berries you picked into them. Yes you may. While our terrain is a little tricky for strollers (gravel, dirt, and grass), our raspberry rows are wide enough for you to bring your strollers with you into the fields. We do ask that you do not change diapers in the field as that is not allowed with our Organic Certification. You may change diapers outside of our growing spaces, closer to the farmstead.